PLEASE BE SURE YOUR DOG IS SMALLER THAN 15 INCHES TO FIT IN THIS BAG. THIS IS FOR SMALL DOGS ONLY! The Jetsetter is a one of a kind pet carrier is a dog car seat, hands free walking leash, has an interior detachable dog walking leash that secures your dog inside the dog purse, dog bed for small dogs or cats, airline approved carrier for small dogs, high fashion designer pet bag, and is vegan friendly. This is the first pet carrier to have all these functions in 1 product to safely secure your pet in the car so you're not distracted by your pet while driving. 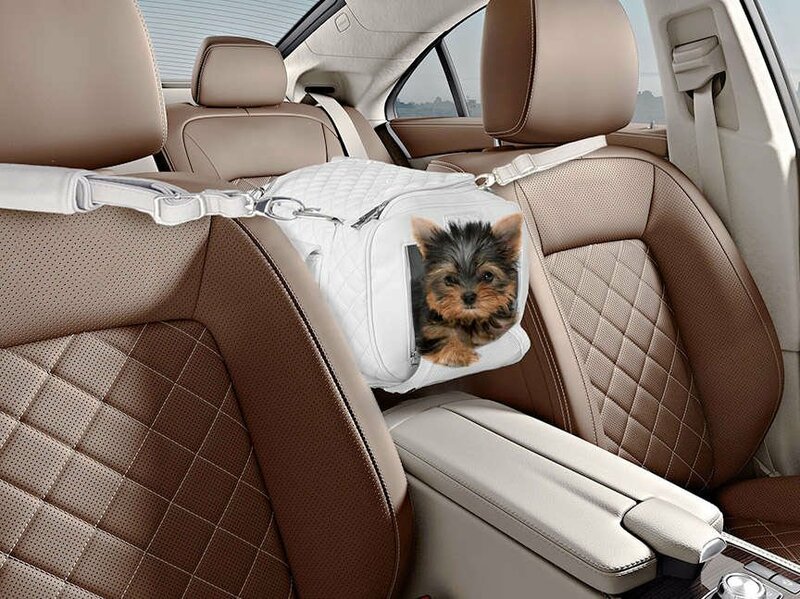 The specially designed Jetsetter straps between the two front car seats so your pet can lay comfortably near you. Attach the Interior Safety Strap to the pets harness so they can stay comfortably inside the bag without distracting the driver. 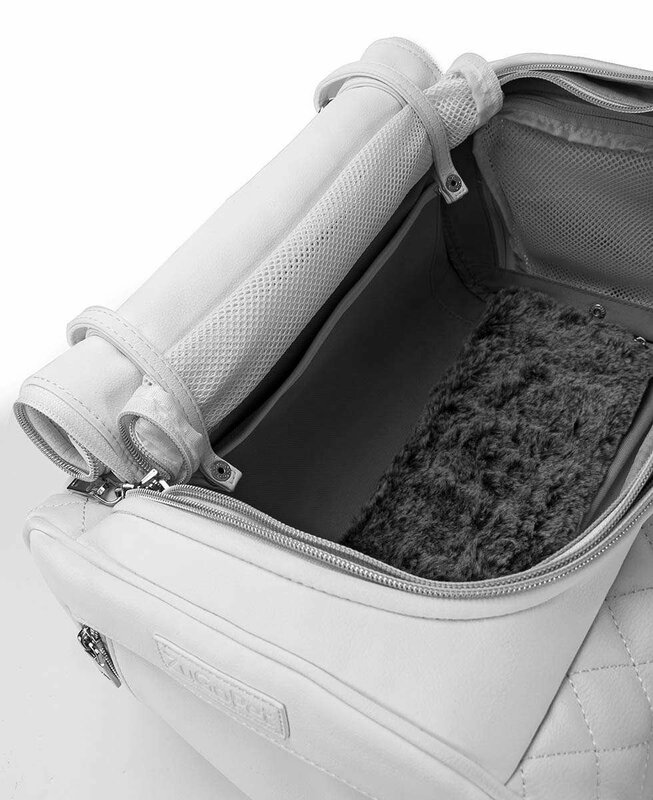 The Jetsetter eases your pets anxiety so they can sleep. They get a great view around the cabin from a central spot in the car. The Jetsetter resides several inches above the center console so you can continue to use it as normal. Patent pending design keeps the bag from folding while hanging between the two front car seats. Car, Train or Plane -- The Jetsetter is specifically designed so you can travel on any airline whether it's domestic or international. 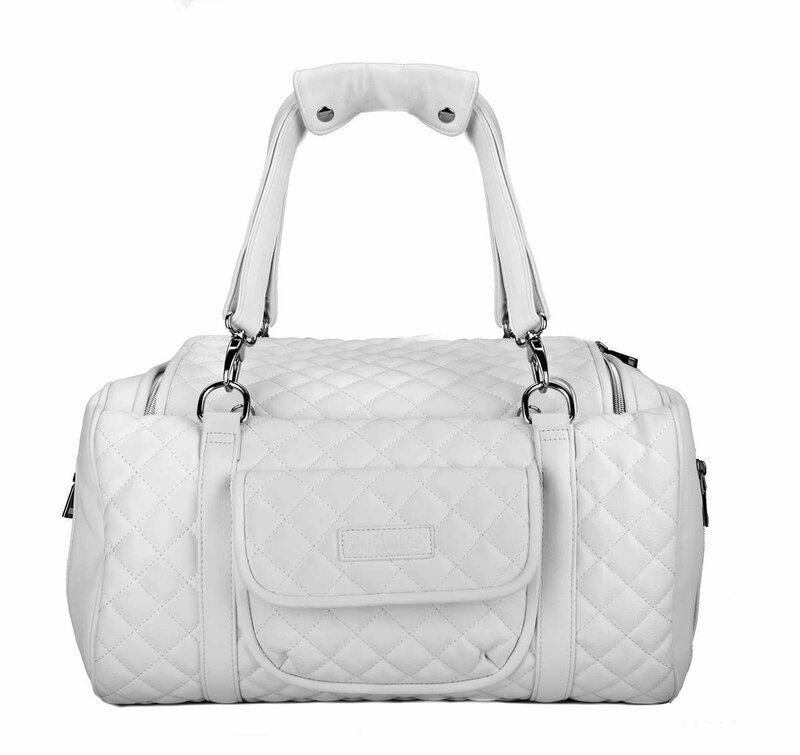 The Jetsetter has three separate double zipper openings with easy to zip, double mesh doors. If your dog wants more privacy or gets frightened easily while traveling simply zip up the two mesh sides allowing air to flow into the bag. Eight pockets - easily store your phone, passport, wallet and more! 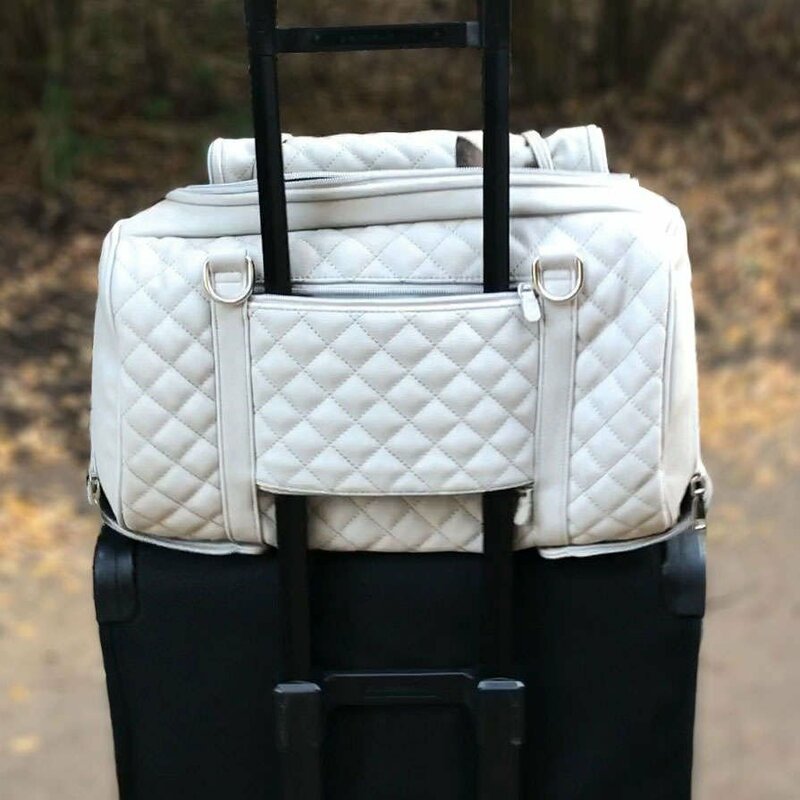 Jetsetter slides on a standard luggage handle, tote your loved one around the airport with ease! Ultrasoft Flexible Washable Pillow - Your dog will feel comfortable and relaxed while feeling cradled in this plush carrier. No more anxiety while traveling. Interior safety strap, that makes sure your dog stays in the bag at all times. Handsfree walking leash with 2 clips - Easily clip your dog onto a fence or any stationary object. ZuGoPet has donated thousands of dollars to rescue dogs out of kill shelters and to help find them happy homes. Every bag purchase helps an animal in need. With our "Buy a Bag, Save a Life" program, any ZuGoPet product purchase we donate to an animal rescue facility. The ZuGoPet Jetsetter is specifically made for dogs smaller than 16 inches. Dogs from 14-20" inches you can still use the bag as a car seat distraction tether. Just open up the top of the bag so they can be positioned right next to you in the car. What is the maximum pet size? Be sure your pet is smaller than the bag so your furry friend will fit! Please measure your pet's length, from the nose to the behind (tail not included). They should not be longer than 14" so you can enclose them comfortably. What colors are available? Currently we have 3 colors, black, grey and white. How much does the bag weigh? The bag weighs 4 pounds. How does this bag help with motion sickness and anxiety? This bag is like a mini dog cave. Some dogs simply feel more secure in confined surroundings. It also has the same effect as a hammock. No bottom support, conforms around your pets body to give a feeling of being cradled, hugged or held. How do you clean the bag? To clean the exterior use a soft rag dampened with soap and water. The interior is made of an easy to clean water proof canvas material. Is Jetsetter crash tested? No, Jetsetter is used as a distraction tether. It has not been crash tested and is used in the car to help with distractions in the car. My little Maltese loves her bag! She's 4 pounds and it fits her perfectly! It's super comfortable and sturdy. I will be traveling a lot with her in this bag and I am sure she will always be comfortable. She loves her bag! The Jetsetter is the perfect size for Briggs. He loves to sit by us when we go places and this carrier lets him do so safely. We love its versatility and sturdy design. It's an awesome carrier! In addition, ZuGoPets' customer service is fantastic, clearly concerned with making the customer happy. It's a win all the way around. Love the Zugo pet carrier, car seat! My Nadia loves it with her Zugo blanket and harness!!! I love that it fits between the front car seats! Nadia gets in and chills. She has a front view to everything happening on the road and isn't on my lap or shoulder. Thank you!!! Nadia loves her new comfy Jetsetter car seat carrier/ pet carrier! After she had a test drive around the neighborhood , she was ready for a road trip. I went and ordered her the harness to go with her car seat and the blanket. Shipping was fast ! After adding the blanket and harness she was all set for her road trip. The blanket was so soft and she just laid right down and enjoyed her trip. It's easy to set up and take out to carrier her in. 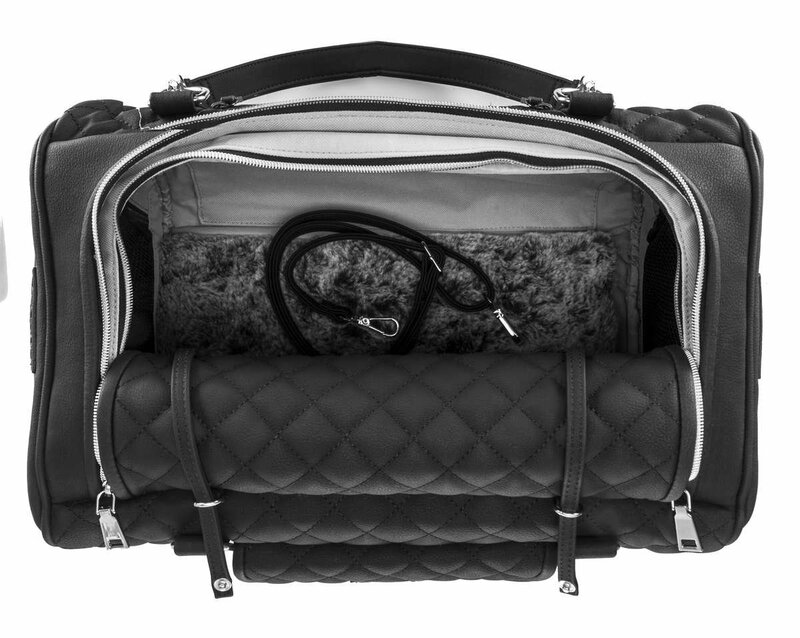 Love the Jetsetter carrier/car seat! It's well made and love the option of adding cooling pads. Nadia weighs five pounds at two and half years old. She is 13 inches from nap of neck to base of tail. She has plenty of room to move. Thank you! This is my lovely Sissy, we are so happy with the Jetsetter, because now she can travel with us more secure. She can see where are we going and enjoy the ride. Very happy with it, a little expensive but it is worth to make sure Sissy is safe. Princess has ridden on my lap for 8 years, for our safety I purchased this car seat thinking I just threw away my money, that she would never stay in it!! To my surprise she loves it and will get in it on command! I do feel safer maybe she does too! I and my little dog Porcha love ours Jetsetter-Premium Car Seat. When we go out I just Pop Porcha into her car seat and there she stays looking out at everything and everyone as she is up high and loving her Jetsetter- Premium Car Seat. Thank you mummy for buying this for me. Side bag is beautiful, perfect and so great. Also, I must compliment your customer service. Thank you so much for expediting the bag. I received this as a gift from my boyfriend who knows I love my dog (sneaky). Well, it turned out to be the best gift ever!! He obviously did his research for Misty and for me because it is absolutey perfect!! I think he is a keeper too! I am obsessed with this bag. I travel frequently and this is the most comfortable bag for me to carry and Bella has abandoned her bed to sleep in it. Bella loves the soft blanket and the term 'shakes like a Chihuahua' no longer applies to her, I just heat a warmer and slide it in the pocket and its magical. Thanks from Tosha and Bella! My dog wont leave the bag he loves it that much!! I love to carry it as well. I'm going to order another in white with the harness. Thank you! My yorkie Button loves this bag! We take it everywhere. He always knows when I'm about to leave the house and immediately jumps in. This is the only bag he's ever taken a liking to like this one. I also I was surprised to see that the white bag is very easy to clean. I use the soft side of a sponge with soap and water. Will definitely be ordering again from you someday. I thought my dog was going to be too large, but since there are so many openings she's able to sit up and enjoy the ride while peeking her head out like the photo. She's 20 pounds and I have been looking forever for a bag that works in the car, airplane and as a functional beautiful dog bag. Well done! Customer for life! Even when I'm home Pumpkin prefers to be in his dog bag rather than his regular bed! He really loves it and feel so safe inside. Love the durability and that its easy to clean. Best bag I have ever owned. My Bella is very particular with bags, usually doesn't like them and only likes my lap. She actually prefers this bag now and not my lap! I'm kind of jealous. haha Amazing quality, easy to use, I wish it came with cooling units, but thats just me being lazy since I can easily buy them for a dollar. ;) Great for the airplane and love the extra pocket space you give us! Never saw that with a dog bag. I never review products, but this bag is AWESOME!! Right when I put this in the car my Ginger fell right to sleep in it! I have been trying to get her to sleep and relax in the car since I got her from the rescue!!! 10 stars! Love love love! I'm going to get a black one as well with the matching blanket! Brilliant design! My bugzie loves it! 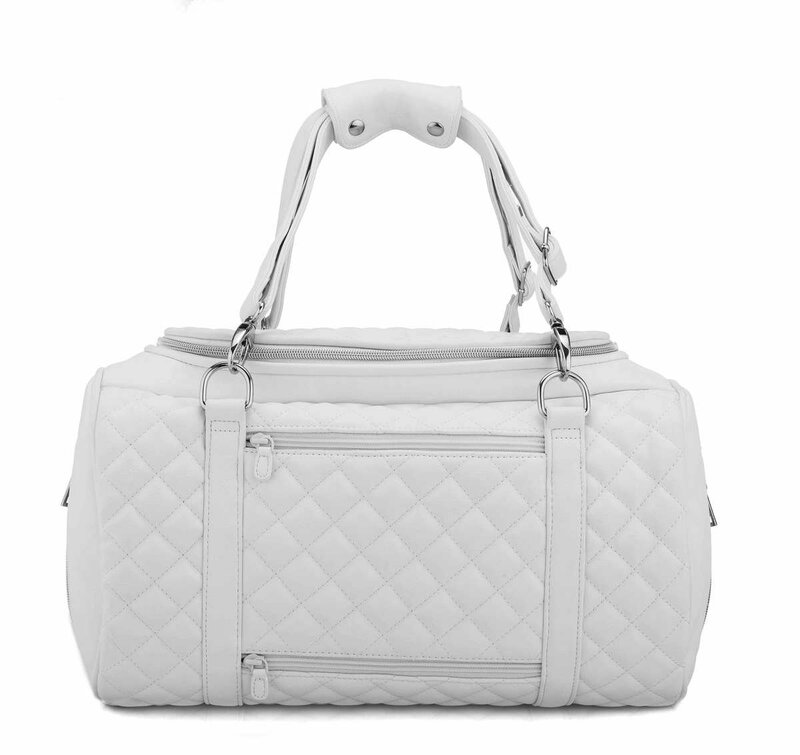 This bag is so stylish! It's everything I could as for in a bag and more! I love that it's really easy to take in and out of the car. No hassle, you just unclip both ends. I don't get questioned if my dog is in the bag either. It looks like a regular handbag so I'm able to take him everywhere I go. My little Lulu loves this bag! It's so comfortable for her she falls asleep on most of the car rides. If she's not asleep she's able to look around outside of the car and enjoy the ride. She loves being right next to me and the way this bag is positioned she's do not get anxiety since she's still close by my side. I love that the seat belt inside comes off and I can use it as a leash as well. So well thought out! Thank you!! I'm so happy about this bag! It's really well made and the functionality of this bag is awesome! Best dog bag I have ever owned! 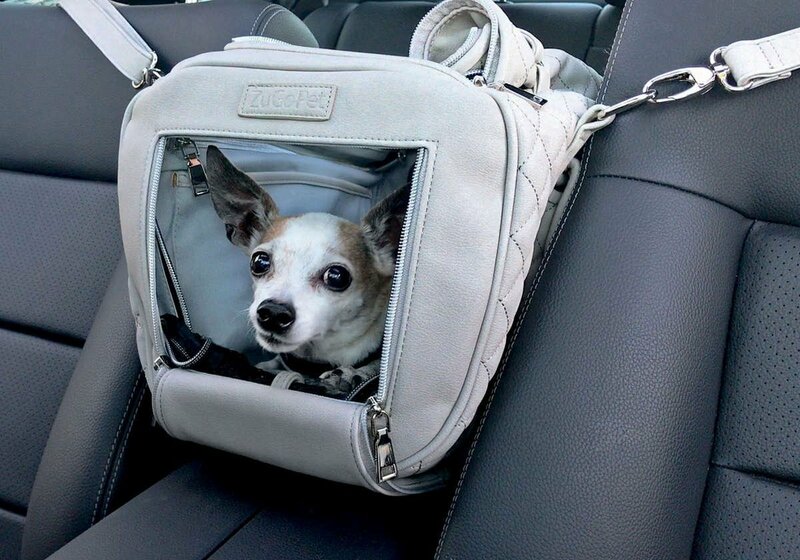 The Jetseter is fantastic, my Sissy, a Chihuahua cross is able to see where we are going and be safe in case we stop in an emergency, and she looks cute between the front seats in the car. We love it, a bit priced! I love it! Shea, our 4 lb. min pin traveled comfortably in her new “car home”! She is hooked to both headrests and is placed proudly on the armrest. I did add a blanket for a little more comfort but she’s happy and I’m happy! 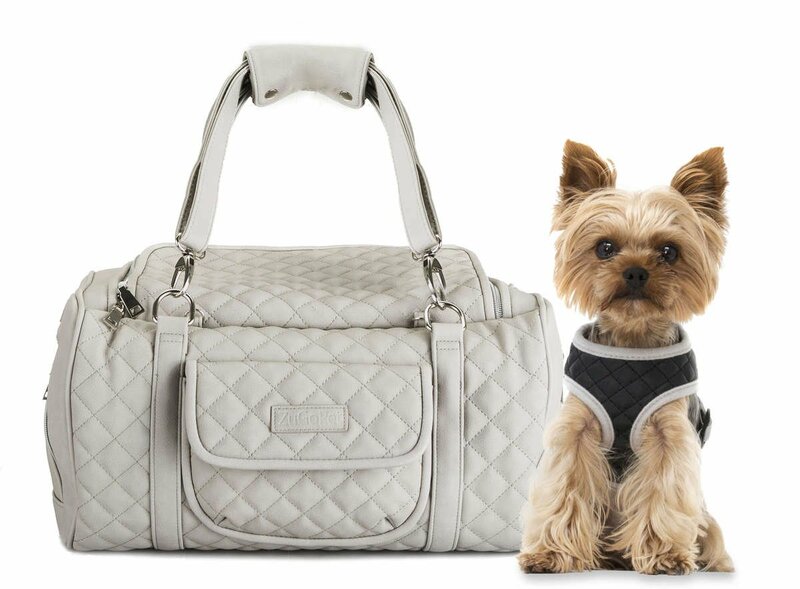 I bought your jet setter premium dog bag for my little rescue Shih Tzu and she loves it. We have just done a 1000 kilometre trip and Porcha was in her bag all the way loving it. When we stopped at lights, people in other cars were checking the bag out. Thank you as without your bag she is very anxious in the car. My Biewer Terrier Yorkie loves it! What a wonderful carrier. My dog is comfy cozy and it is comfortable to carry. Thank you! I just want to share how much i appreciate the thought you put into this bag. I get compliments all the time since Peanut goes everywhere with me. I really like all the pockets and options it allows. Good design! So now my husband doesn't mind carrying a pink bag! I picked it for the features and softness of the bag for a flight. I had no intentions of ever using it other than for traveling. But Rapter (Yes that is his name) knows how to pick a bag too, LOL. He no longer is in my lap, but no longer whines and cries because he is still close to me. It really has proven to be a fabulous surprise. My husband insists that Rapter picked it out! I love this bag! It seriously does everything. I saw this advertised on FaceBook and I'm usually very skeptical of FaceBook ads, but this one is as advertised with even better quality than I expected. Totally worth the price!